We are pleased to announce that Carleton University, rightsholder of internationally acclaimed Alexander Young Jackson’s works, is now represented by SODRAC. Our repertoire is thus enriched with works by the founding member of the Group of Seven, who were “the most important Canadian artists of the first decades of the twentieth century” (Canadian Encyclopedia). Born in Montreal in the fall of 1882, A. Y. Jackson dedicated his life to drawing and painting. His father having deserted the family home, he started working at the age of twelve in the offices of a lithography company and devoted his free time to drawing, copying illustrations he found in newspapers. Quickly noticed for his talent, he was transferred to the company’s artistic department. This first experience was a first-hand contact with the art world and was followed by jobs in printing, photogravure and lithogravure companies. He took evening classes – up to four a week -, to feed his newfound passion. He traveled to Europe, the United States, then back to France where one of his paintings was presented at the Salon de peinture et de sculpture de Paris. 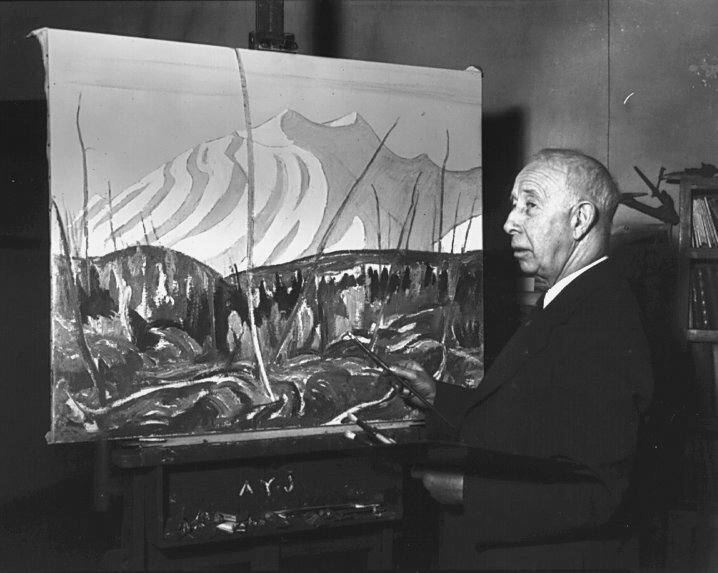 As recognition of his work grew, the National Gallery of Canada bought two of his paintings. Despite this, once back home, he contemplated moving to the United States after an unsuccessful exhibition in Montreal. The course of his life was then set by a letter from Toronto painter J. E. H. MacDonald stating that another peer, Lawren Harris, wanted to buy one of his paintings he saw in Toronto. The purchase materialized and A. Y. Jackson forged links with these artists, friendship that led to the founding in 1919 of the Group of Seven, a collective dedicated to painting nature and wild landscapes. A. Y. Jackson served in the First World War and was as an official war artist from 1917 to 1919. His prolific career lasted until a stroke prevented him from painting in 1965. He died in 1974, at the age of 91, in Kleinburg, Ontario, after having been an artist-in-residence at what is now the McMichael Canadian Art Collection. SODRAC represents all works of A. Y. Jackson, with the exception of two corpuses whose rightsholders are the Canadian War Museum and the McMichael Canadian Art Collection.